Dutchmen campers are among the top names in the industry for good reason. Known for affordable camping units that don't skimp on features, Dutchmen campers are sought after whether new or used. With a wide range of models to choose from, you'll find one that is perfect for you. Originally founded in 1989, Dutchmen became a brand of Thor Industries in 1991. Now one of 20 brands owned by Thor industries, Dutchmen is known world-wide as one of the largest brands of tow travel trailers. Along with an outstanding product, Dutchmen camping trailers also have an outstanding warranty. All new Dutchmen travel trailers and fifth-wheels are covered by a generous two year limited warranty, a one year bumper to hitch limited warranty, and a two year structural and appliance limited warranty. What this means for you is that the plumbing, heating and electrical systems are warranted against structural or manufacturing defects. This warranty is only valid when the owner maintains the unit properly. An abused unit cannot be covered. The warranty is non-transferable. If you sell your unit six months after purchase, the remaining warranty time is void. However, once you buy a Dutchmen trailer you are unlikely to want to sell it any time soon. Dutchmen has several models to meet the needs of every camper. The Dutchmen Lite has 14 floor plans ranging from 18 feet to 31 feet long with weights starting at 4200 pounds. Three floor plans for the Dutchmen fifth-wheels range from 6720 pounds to 7278 pounds for 26 to 29 feet long. 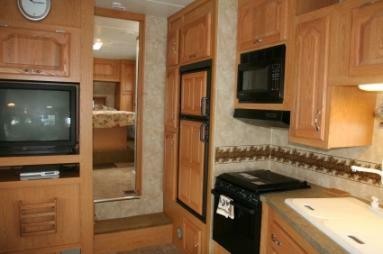 You can view the many floor plans at the Dutchmen RV web site. One of the best qualities of Dutchmen camping trailers is the fact that they have so many standard features that other companies provide as additional options, which of course means additional money. For the average camper who doesn't want to spend $30,000 on a unit that may only be used for the summer, this is great news. When you buy a Dutchmen camper, you get more for your money. You can view many more standard features as well as optional features on the Dutchmen features and options page. On the Dutchmen web site, you will find a handy dealer finder that will help you find a dealer near you in the United States or Canada. You can also find used Dutchmen travel trailers, pop-up trailers and fifth-wheels on line and at dealers. One great place to find a deal is eBay. Look under the eBay Motors category and select "Other Vehicles & Trailers"
You may also find a great deal by searching Craig's List where you can select the country and city and then browse the free classified to find items where you live. Other helpful resources include RV Trader and RVs.com. No matter if you buy new or used one thing is certain, Dutchmen campers provide all the comforts of home without the over-inflated price tag. If you thought owning an RV or other camper was only for people with a lot of money to spend, think again. You can own a home away from home with many extra features that other manufactures charge for. So, what are you waiting for? Gather up your camping gear and get ready for a relaxing, fun filled vacation in a Dutchmen camper.